The Child and Adult Care Food Program (CACFP) allows Our Daily Bread CACFP to provide monthly reimbursements to child care facilities and homes. You simply report your attendance and daily meals served, file a monthly claim and receive a direct deposit payment for the qualified meals & snacks served. The current reimbursement rates can be found here. I am ready to join the Our Daily Bread and the (CACFP) program. What should I do next? The Child and Adult Care Food Program (CACFP) is a federally funded program sponsored by the United States Department of Agriculture (USDA) that provides financial reimbursements to certified/licensed daycare centers or homes and registered/alternate-approved (Non-License) daycare home providers, for serving nutritious meals and snacks to children in their care. To be eligible you just need to be a licensed facility or alternate approved day care home (non-licensed) whose meals meet the USDA guidelines. You will receive a payment for every month that you claim. If you participate under Our Daily Bread CACFP you will usually receive your direct deposited payment by the 3rd week of the proceeding month that was claimed. This is provided your claim for reimbursement arrives in our office by the 1st week of each month. You will receive your reimbursement later if ODB CACFP receives your claim later. Your payment amount will depend on the current reimbursement rates listed below, what meals you served, and how many children you served them to. Reimbursement rates change annually and are established by the USDA. One of your enrolled day care children is eating the same meal you’re claiming for your own child. 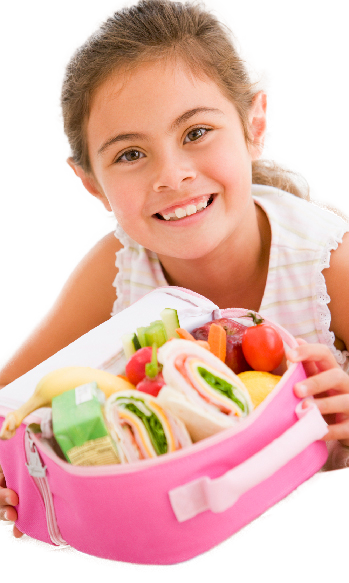 The Child Care Food Program (CACFP) meal pattern requirements are intended to promote the development of good eating habits and nutrition education by using a well balanced diet with a wide variety of foods. This chart is here to help you plan meals that meet the USDA requirements for reimbursement and are nutritious, fun, and delicious. The Meal Pattern design consists of approvable foods that are grouped for service at breakfast, lunch, snack and supper. The USDA pays you based on meals served; not for individual foods. But, it’s important for you to understand how to assign individual foods to the make-up of each meal you plan to serve. To be reimbursed, you cannot deviate from the meal pattern. You may enhance the meal pattern with additions of approvable foods for extra calories/vitamins/protein/appeal, etc. An example would be to add an egg (meat substitute) to the otherwise required components for breakfast. Please fill out the CACFP eligibility application to begin your enrollment. Are you ready to join Our Daily Bread CACFP food program? Complete our ‘new provider information form’ and a representative will contact you shortly to discuss your eligibility.